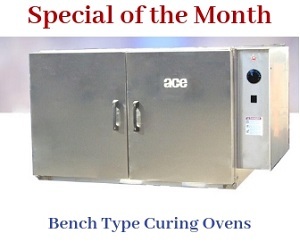 The ACE Model 260 RT burn off oven is a heavy duty oven than previous models 230 to 245. Besides the common features, this oven is designed to have the One Touch Control (OTC) system, and the high fire afterburners as standard components. As it is capable of taking on more components for de-coating, the oven is also designed with four primary and secondary water nozzles. To ensure that the pressure within the oven is released quickly, the model 260 is also designed with two top mounted pressure relief hatches, rather than one. Our model 260 RT ovens adhere to the regulations regarding specifications laid down in NFPA-86. We can also design the oven to meet the specifications of FM/IRI standards. To know more about the details of this model, please look at the components and specifications given in the tables below. Volume Over Cart 207 CU. FT.
1 Top Mounted Pressure Relief Hatch 17.33 SQ. FT.